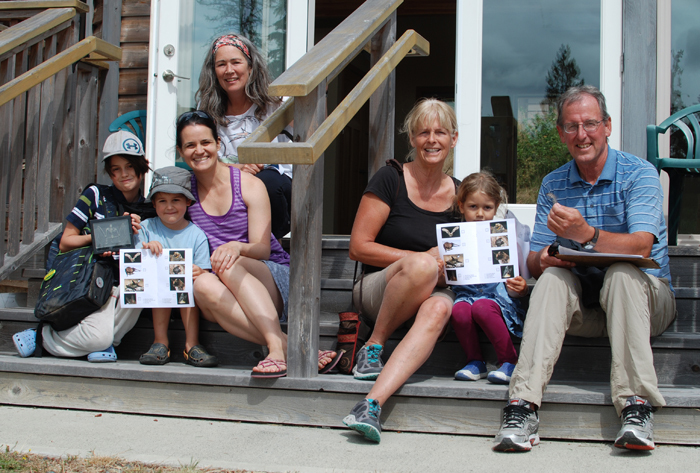 Gathered at the Blackburn Lake Nature Reserve building after some Batty Over Bats activities are, on the left side, Brady, Justin and Laura Lacroix, with program leader Cathy Lenihan behind them, and Anne and Geoff Parkinson with granddaughter Audrey Sloan. The final free drop-in summer session called The Painted Turtle runs this Saturday, Aug. 18. The Stewards in Training program, first launched by the Salt Spring Island Conservancy in 2002, has been a staple of school life for island students. According to the conservancy’s website, the program is influenced by Last Child in the Woods: Saving Our Children from Nature Deficit Disorder, a much-touted book by Richard Louv, and is guided by B.C. education ministry policies on environment learning. This summer the conservancy has offered a different kind of ecological education, aimed at kids aged six to 12 who are accompanied by an adult. Called Family Adventures in Nature, the free Saturday drop-in sessions led by Stewards in Training facilitator Cathy Lenihan have had a different focus each week. Anne Parkinson attended last Saturday’s session, called Batty Over Bats, with her five-year-old granddaughter Audrey Sloan from Powell River. This Saturday, Aug. 18 is the last in the summer series, when the painted turtle will be the star of the show for the session running from 10 a.m. to 1 p.m. (Families can drop in at any time during the three hours.) In the fall and spring months, more programs will be offered. Activities include arts and crafts, learning nature songs, identifying wildlife species, clay mask-making and more. For more on this story, see the Aug. 15, 2018 issue of the Gulf Islands Driftwood newspaper, or subscribe online.